"This traditional Bahamian dish is served with a side of grits and bread or Johnny cake. Add lime and hot pepper to spice it up to your individual taste. It's delicious and surprisingly simple!" Heat the vegetable oil in a large pot over medium heat. Add the onion and green pepper; cook and stir until the onion has softened and begun to brown, about 10 minutes. Add the potatoes, carrots, red pepper flakes, allspice, bay leaves, marinated chicken, lime juice, and water. Bring to a simmer, then reduce heat to medium-low, cover, and continue simmering until the chicken is no longer pink at the bone, and the vegetables are tender, about 40 minutes. Season to taste with salt and pepper before serving. 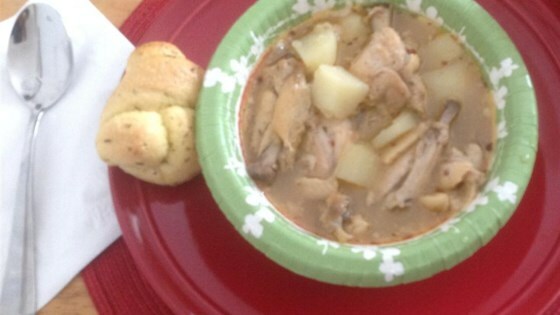 This may not be the traditional recipe for Bahamian Chicken Souse, but it's a good tasting nontraditional recipe. I don't know if it's traditional or not, but I made it & my family loved it. The only things I did different was add more seasoning & boiled the fat & grease off the chicken first. Came out DELICIOUS! Reminds me of the islands :-D THANKS!! !